While hackathons often produce a startup company, TechRaising was really an opportunity for us to work together on a project. I recently participated in my 4th Tech Raising hack-a-thon weekend. In past years I’ve run teams of up to 22 people, but this year I decided to join my friend Spencer Lindsay‘s team as an individual contributor. Spencer is a 3D digital artist I’ve known for about a decade through our co-working space. Spencer had an idea for a location based augmented reality application for sharing digital objects in the real world. The idea is that you can leave a digital object at a specific location, and share the object with someone, requiring that they show up to that location to find the object. That could be a 3D hand written note, picture, or perhaps a 3D object. We were joined by fellow NextSpace alumni Sue Dayton, David Fierstein, and Mike “Doon” Muldoon. We sat in a conference room for two days furiously creating a product from concept to proof of concept, and presented our project to a room full of spectators and a panel of judges. While hack-a-thons often produce a startup company, this was really an opportunity for us to work together on a project. David and Mike were brought in to do programming in Unity which provides a 3D platform with a plugin ecosystem and the ability to author native iOS apps. Sue is a UI/UX designer amongst many other capabilities we needed on our team. The interesting part of any project, particularly a time sensitive hack-a-thon, is figuring out where to start. Since our mantra is Failure-Is-Not-An-Option (thanks Gene Krantz), we had to quickly devise a method to divide and conquer individual parts of the project while minimizing the possibility of stepping on each other’s toes. Of course we used Git to assist us to that end. Since I’m not a 3D artist or Unity coder, my portion of the project was to create the backend for the app. This was necessary to share objects between users, and to manage the user/object data. 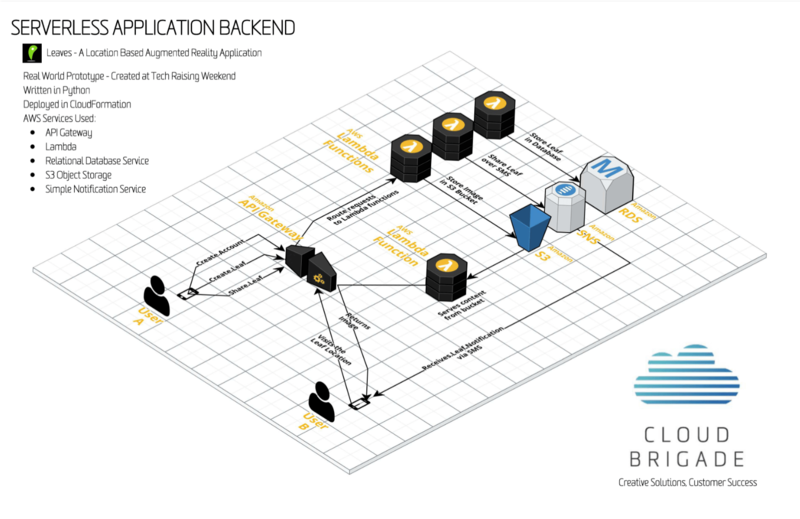 My company Cloud Brigade specializes in solving complex technical problems for our customers, and one tool in our offering is Amazon Web Services. As an Amazon partner, this was a cool opportunity to build out a proof of concept serverless backend and at the same time create some related marketing materials that display what we can do for our customers. The above image was created in Cloudcraft which is a really cool tool for not only drawing, but estimating basic cloud costs.